As companies move to increasingly adopt virtual and augmented reality technology, Full Sail University is becoming a national frontrunner by providing businesses with the talent necessary to drive innovation in these fields. 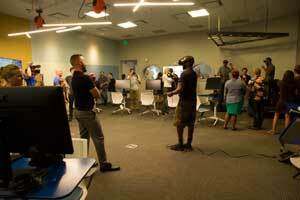 Full Sail University is one of the few U.S. schools educating students specifically in the areas of virtual and augmented reality. Just last week, Full Sail University unveiled its newest addition to the campus: The Virtual Reality (VR)/ Augmented Reality (AR) and Fabrication Lab. This fully equipped, state-of-the-art educational facility will serve to inspire technical innovation, creation and exploration for students within Full Sail University's Simulation & Visualization Bachelor of Science degree program, which Full Sail launched in December of 2015. The Virtual Reality (VR)/ Augmented Reality (AR) and Fabrication Lab is a $3 million space that combines two labs: one focused on manufacturing tools for VR and AR (the fabrication or “fab” lab), and the other housing the AR/ VR program. With this new lab, Full Sail University sets the stage to position its students to meet the future demand for content and applications developed specifically for virtual and augmented reality technologies. This month, Full Sail will also introduce coursework within its simulation and visualization program that will prepare students for future careers. Full Sail University’s new labs and educational programs strengthen Orlando’s simulation community and reinforce the greater Orlando area as a technology leader. Full Sail’s critical investment in the country’s future workforce advances Central Florida and Orlando as a pacesetter for the future of VR and AR applications and technology. 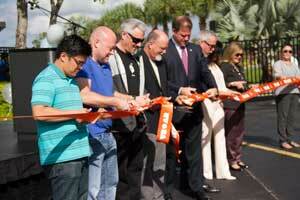 The new lab unveiling, formal announcement and ribbon cutting ceremony was held on Friday, August 12th. The ceremony included technology pioneers from all around the metro Orlando area, as well as institutional and academic leaders.